St Dom-index Player Ratings for the Chelsea vs Everton game on Saturday 22nd February 2014. Despite playing incredibly well for the majority of the game, Everton left Stamford Bridge empty-handed after a late goal, credited to Frank Lampard, ensured the Blues went unrewarded for a second Premier League match running. Our regular player rating column is back, all be it a little late, it takes a while to get over some defeats, with Alex Jones casting his eye over proceedings. Up until the goal he played very well. He saved us from conceding on many occasion, the one that caught the eye was the double save where he saved Gary Cahill’s volley. 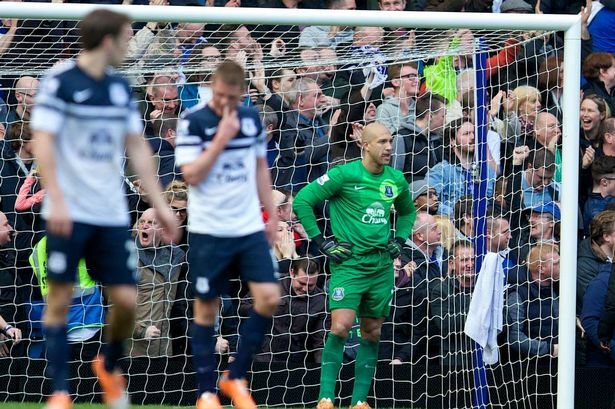 I also think that Martinez will pick Howard to play against Arsenal in the FA Cup with Joel Robles missing out. A solid performance and he attacked well. One of the hardest workers in the team, Baines is starting to run into the type of form that won him last seasons player of the year award. Was solid at the back and kept Torres and Eto’o quiet for the whole game. Because Chelsea heavily rely on their playmakers, e.g. Hazard and Oscar, they are often playing the ball around just on the edge of the area, and Jags was able to put in some crucial blocks and interceptions to prevent a touch of class from Hazard. Very similar to Jagielka, by this I mean he put in several good tackles and interceptions, however I don’t feel that he can be awarded MOM because of their goal, where I think he switched off for 1 second and put all of Everton’s hard work to waste. Apart from this he was solid at the back, so I don’t feel it’s fair to be over critical. A good performance and defended very well, the only thing I can say he did badly, was running at the defenders. When we were winning a lot of games, he was one of our most important players, this was because he would run at their defenders just outside the area then he was able to cut in and shoot or cut in and set up someone else, and recently for whatever reason he hasn’t been doing this. Wasn’t brilliant, he didn’t look interested for most of the game. Very early on when we were playing good football he was the only player that looked out of his depth. It almost looked like he was trying to impress Hazard at times. Similar to Seamus i think that he is key to a good Everton side. An in-form Mirallas can win a game for any team. Started off poorly, but vastly improved as the game progressed, he was winning the midfield battle and made Lampard look average. Not only did he defend well but he also attacked very well, he was able to beat their defensive midfielders for pace and then thread a ball through to Naismith or any of the wingers. However none of these passes ever amounted to a goal, purely because we don’t currently have a goal scorer in the team. Looked good on occasions. Used his quick feet to wriggle out of tight positions and put us on the counter-attack. But towards the end of the game just before he was substituted he looked very tired and wasn’t doing his job well enough. Also very close to getting my MOM, primarily because of his defensive performance. Every time Oscar or Hazard got the ball he was always putting them under pressure not allowing them any space at all. Not only was he applying pressure, but he often forced them into a mistake. Again looked poor, I think he’s tired and needs a rest. I say this because, when we look like we are going to counterattack he always seems to insist on slowing the play down and wasting our attack. Also he isn’t doing much work defensively which is putting a lot more pressure on Baines. Had a very tough job and I think he did it quite well. Obviously he was not expecting to start but this didn’t seem to affect his performance much. It was always going to be a tough game for him, he was, for most of the game trying to win an aerial battle with Terry and Cahill, which to be honest he was never going to win. I do think he has very good movement when we are attacking. He’s always on the last man and looking for the killer ball to tear the defence apart. Not much to say about his performance as he wasn’t on for long, but he definitely looked the better of the three subs. Had an awful game and looked tired. I think it was a really bad decision to bring him on in a game like that because i think this will have really affected his confidence in a negative way. Similar to Ross, looked poor, but i think it is Gerard’s job to come on in games like that and make a positive impact.